The Princess Durru Shehvar College of Nursing. 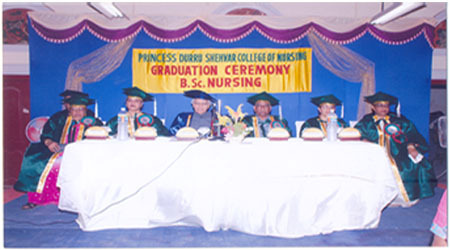 The Princess Durru Shehvar College of Nursing (PDSCON) offers the 4 year degree course in nursing recognized by the A.P. State Nursing Council vide G.O. Ms. No. 381 and the Indian Nursing Council (INC) New Delhi, vide File No. 18-937/2002-INC respectively. It is affiliated to the Dr.NTR & Kaloji Narayana Rao University of Health Sciences, A.P. vide proceedings No.8268/A5/Nsg/99.